Hematidrosis: a pathologic process or stigmata. A case report with comprehensive histopathologic and immunoperoxidase studies. Cases of hematidrosis (bloody sweat) are extremely rare. This disease has been described in various terms and has been often tied to religious belief as stigmatization. We report a typical patient with hematidrosis in a 14-year-old girl who frequently bled from her scalp and palms, and, occasionally, from trunk, soles, and legs. The bloody sweat from her scalp contained all blood elements. Immediate biopsy after there was bleeding on her scalp showed multiple blood-filled spaces that opened directly into the follicular canals or on to the skin surface. Immunoperoxidase studies failed to demonstrate vascular nature of these spaces. Our study explained how and why there was bleeding in our patient and in patients with related conditions as described in earlier literatures. We also explained why this phenomenon was intermittent because the spaces indicated above will disappear after exuding their content but then reoccurred after the blood flow was reestablished. [Clinical and laboratory study of a case of hematidrosis]. To study the clinical characteristics and pathogenesis of hematidrosis. Detailed clinical manifestations and natural history of a patient with hematidrosis were presented. A series of laboratory examinations were performed, and skin pathohistologic features and ultra microscopic structures were observed. The episodes of skin bleeding occurred on any site of the body spontaneously and promptly. The skin surface bloody extravasation has identical cell components as that of peripheral blood. All the results of laboratory tests were normal except a positive Trousseau's test. Skin pathohistological study revealed some intradermal bleeding and emphraxised capillaries. No abnormality was found in sweat glands, hair follicles and sebaceous glands. The pathological basis for hematidrosis might be a distinctive vasculitis. Blood, sweat and fear. "A classification of hematidrosis". In order to verify the accuracy of the commonly used statement, "I sweat blood," a survey of the literature in the subject of hematidrosis was made. Seventy-six cases were studied and classified into categories according to the causative factor. These were, component of systemic disease, vicarious menstruation, excessive exertion, psychogenic, and unknown. The psychogenic were further subdivided into those that occurred only one time, those that recurred and the stigmatics. Acute fear and intense mental contemplation were found to be the most frequent inciting causes. Hematidrosis is an extremely rare clinical phenomenon with only few instances reported to have occurred within the twentieth century. Developmental venous anomaly (DVA) with arterial component: a rare cause of intracranial haemorrhage. 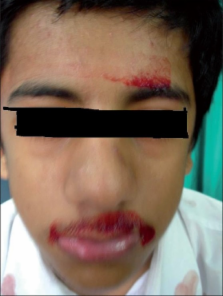 Head and neck granulocytic sarcoma with acute myeloid leukemia: three rare cases.